Oh My! I have found a wonderful scone recipe. These are delightful treats! Place on a lightly floured surface and pat into a 7- to 8-inch circle about 3/4-inch thick. Sprinkle with remaining 1 tsp. of sugar. Use a sharp knife to cut into 8 triangles; place on a cookie sheet (preferably lined with parchment paper), about 1 inch apart. Cranberry-Orange Scones - Follow the recipe for Simple Scones, adding a generous teaspoon of finely grated orange rind (zest) to the dry ingredients and substituting dried cranberries for the raisins. Lemon-Blueberry Scones - Follow the recipe for Simple Scones, adding a generous teaspoon of finely grated lemon rind (zest) to the dry ingredients and substituting dried blueberries for the raisins. 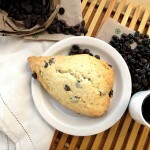 Cherry-Almond Scones - Follow the recipe for Simple Scones, adding 1/2 tsp. almond extract to the sour cream mixture and substituting dried cherries for the raisins. I made them for Father’s Day breakfast – they were great! Thanks for the recipe! !